Bringing a new pet into the home can be a joyful and exciting experience. Here are a few things families should keep in mind when adopting a new animal friend. It's ideal if owners can be home with their new pets for a couple of days before leaving the animal alone so they can get better acquainted with their pet and make sure the animal is feeling secure. People adopting pets might arrange to pick up the pet on a weekend or take a few days off of work after the pet arrives. Once a pet is adopted we recommended taking him/her to a vet to have a health examination and make sure all vaccines are up to date. Many time especially with young puppies there are vaccines that need a booster. 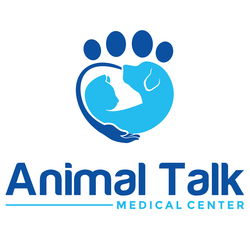 Animal Talk doesn't offer any pets for adoption on a regular basis anymore. We get the occasional pet that needs a new home and we use our Facebook to help find these pets homes. If you are looking to adopt a pet we recommend checking out No Time to Spare Animal Rescue and Sanctuary.